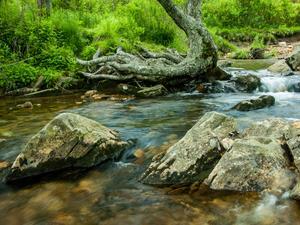 "Graveyard Fields" is the name of a high mountain valley adjacent to the Blue Ridge Parkway south of Mount Pisgah. With its relatively open views, cool summer temperatures, cascading waterfalls, and wide variety of hiking trails, Graveyard Fields is one of the most popular outdoor recreation areas in all of Western North Carolina. 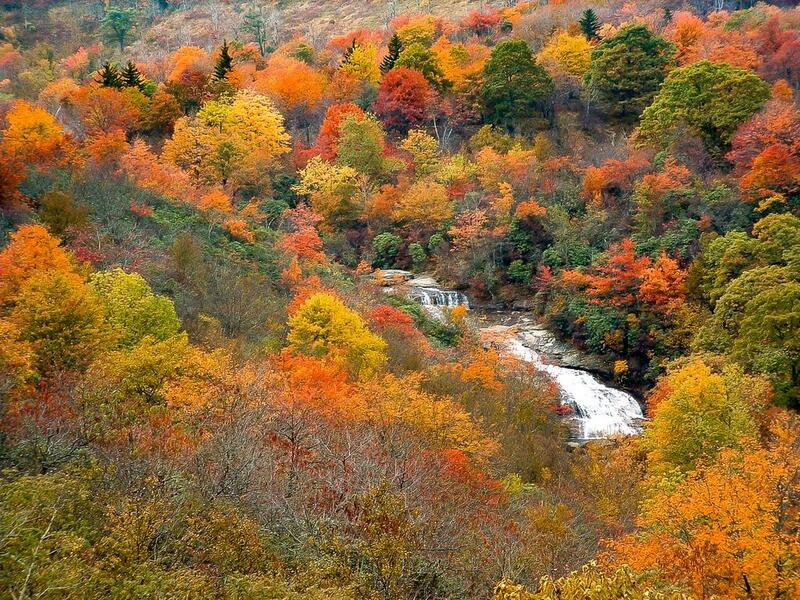 Second Falls in autumn color. Hardy oak hanging out over the Yellowstone Prong. This unusually flat valley at over 5000 ft in elevation was once like an upside-down mountain "bald", with fields of high-elevation grasses and shrubs carpeting the valley floor. True mountain balds surrounded it. But, like many summit balds, the valley is slowly growing over with shrubs and trees, replacing the once-open areas with young forest. The Yellowstone Prong gathers in the surrounding peaks, tumbles over Upper Falls into the western end of the valley, flows lazily through it, and then spills out the eastern end over Second Falls (before going on to form Skinny Dip Falls and the Big East fork river in the Shining Rock Wilderness Area). 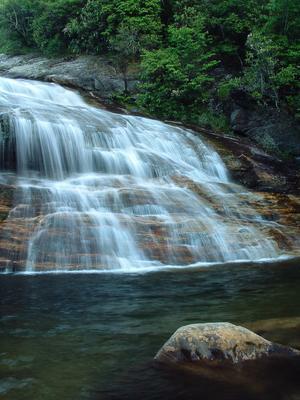 Between the Upper Falls and Second Falls the river is slow and flat, with meanders, gravel bars, braided channels and crystal-clear still pools supporting native Brook trout. Rare mountain bogs lie along springs and seeps in the valley. 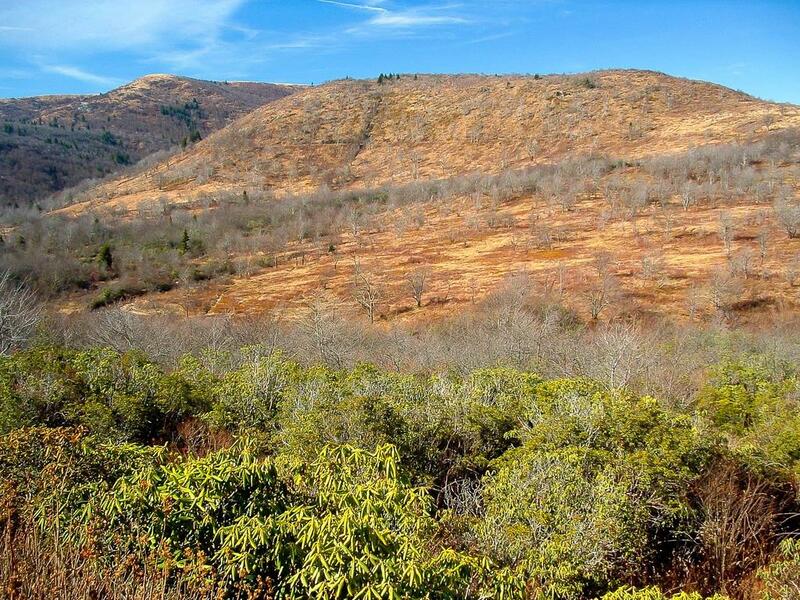 There's no shortage of trails to explore in Graveyard Fields. While unofficial "manway" trails wind all over the valley, a good network of official trails are in place and should be used instead. 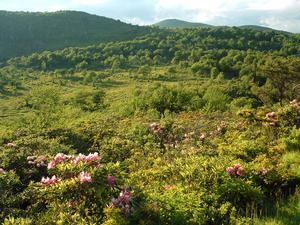 An excellent loop trail (the Graveyard Fields Loop) enters the area from an understandably crowded overlook on the Blue Ridge Parkway. From it, spur trails lead to two of the three major waterfalls on the Yellowstone Prong. The Graveyard Ridge trail ascends and then travels along its eponymous mountain before ending at the intersection with the Ivestor Gap and Mountains to Sea Trails. 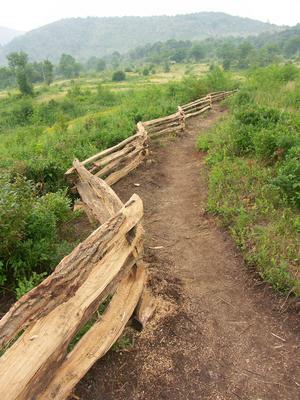 These trails lead up into the Black Balsam Knob area and on to the Shining Rock Wilderness (the Mountains to Sea Trail leads to the Shining Rock Wilderness in both directions), making for some excellent day and overnight hikes. This is just an overview of trails available in this Trailhead area. For all the trail details, visit the trails page. Here's a map of the Graveyard Fields area. For more maps, including printed publications, see our Graveyard Fields maps page. The area certainly has an interesting name, and there are several theories about what might have lent the moniker. A natural explanation for it originates from a time when a windstorm blew down hundreds of the spruce and fir trees that originally blanketed the entire area. The upturned roots supposedly resembled gravestones in a graveyard. But there is a man-made explanation as well. During the early 1900's, when the mountains were being extensively logged, all that remained in this valley were the stumps of cut trees. Over time, mosses eventually grew all over the stumps, resembling an overgrown graveyard. However, later during the logging era, catastrophic fires swept through the area, destroying anything resembling a graveyard and heating the soil enough to sterilize it. The once dense spruce-fir forest was changed into an open area of meadows and rocky slopes, making the area popular for recreation thanks to the unusually open views that catastrophe afforded. For many years after the fires, plants had trouble growing in the nutrient-poor soil. Periodic smaller fires aided in keeping the area open with mostly grasses. Mother Nature has invested a lot of energy into improving the soil, however, and today the trees, shrubs, and herbs that once blanketed the area are re-establishing themselves (to the detriment of the once-ubiquitous views). Graveyard Fields is now more properly a young forest than the "fields" from times past. 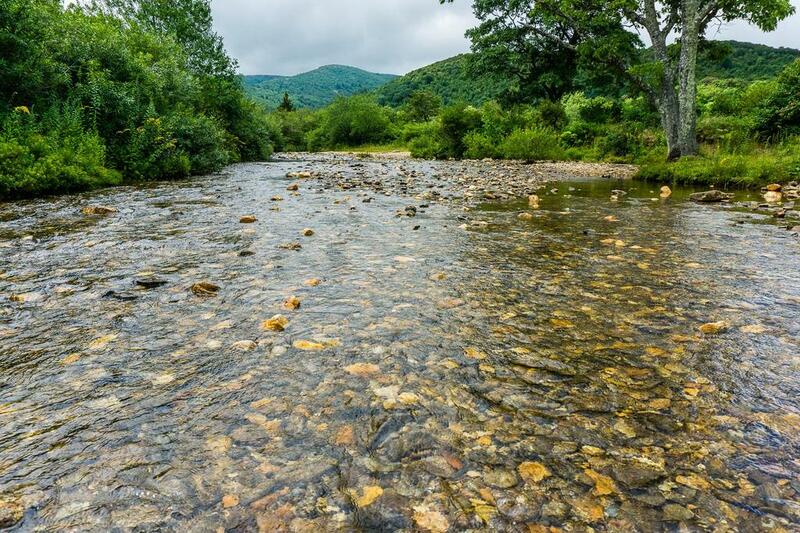 The yellow-colored stones that give this stream its name are apparent on a sunny day in late August. This is looking toward Graveyard Ridge and Black Balsam Knob, at the oak tree that has been hanging out over the stream for decades. Camping in the "Graveyard Fields Vicinity" has been "temporarily" prohibited since March 2015 due to bear activity. 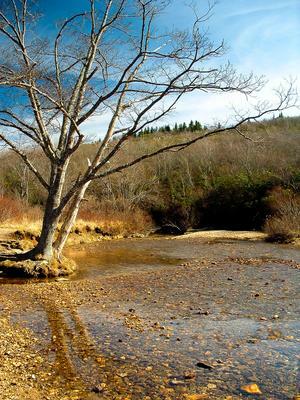 It is unclear if this restriction may be lifted in the future, and it is not exactly clear what constitutes the "Graveyard Fields Vicinity" for the purposes of this restriction. To be safe, I'd assume anything within or on the margins of the Yellowstone Prong drainage to be off-limits. That includes along the Graveyard Ridge trail, the gap between Graveyard Ridge and Black Balsam, and the areas above Yellowstone Falls. 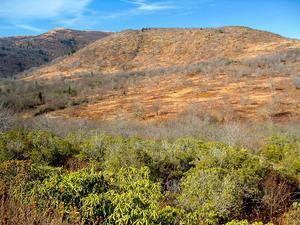 The Blue Ridge Parkway's Graveyard Fields overlook has been expanded, from 15 parking spaces previously to 40 now. In addition, a solar-powered pit toilet was installed to meet the needs of visitors. However, parking is now prohibited along the Parkway shoulders and outside of designated spaces in the official overlook. Rangers are issuing tickets for those found to be illegally parked; if the lot is full, hike in from the Mountains to Sea Trail (from Looking Glass Rock Overlook or Black Balsam Road), or visit another time. The upper bridge over the Yellowstone Prong was reconstructed and should be adequate for many years in the future, no matter what floods may come. This completes the loop and most of the trail maintenance issues in the area; however, there are still some very bad sections of trail and the newly constructed trail isn't holding up perfectly either. Still, it's an improvement. Fall color peaks early at Graveyard Fields - this day was actually about a week late for this area. Upper Falls is nearly enshrouded in clouds being fed into the departing Hurricane Matthew. Camping is not currently allowed in Graveyard Fields - see the above notice. Camping is normally allowed anywhere on National Forest property, subject to applicable National Forest backcountry camping regulations. Dispersed camping is allowed in the National Forest outside Graveyard Fields. Bear canisters are required in areas outside the Graveyard Fields Vicinity that are still open to camping. All bear canisters must be commercially made; constructed of solid, non-pliable material manufactured for the specific purpose of resisting entry by bears. Some campsites in the area are over-used, but it's better to use one of those than to make a new one. Just do your part to keep it clean - don't trample vegetation, don't leave half-burned logs in the fire ring, and don't take a soapy bath in the stream! There are no developed campgrounds in the immediate area. The closest ones would be at Mount Pisgah, about 20 minutes south on the Parkway, and Davidson River Campground, about 30 minutes East along US Hwy. 276. Take the Blue Ridge Parkway South past Mount Pisgah and US Hwy. 276. 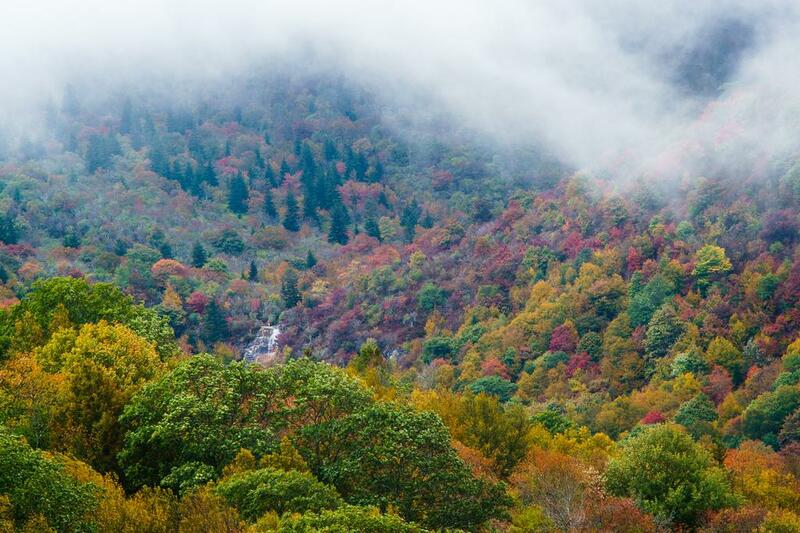 The Graveyard Fields overlook is at milepost 418.8, just over 25 miles from the NC 191/Brevard Road entrance to the Parkway in Asheville. Park only in designated spaces (there are 40 of them now). 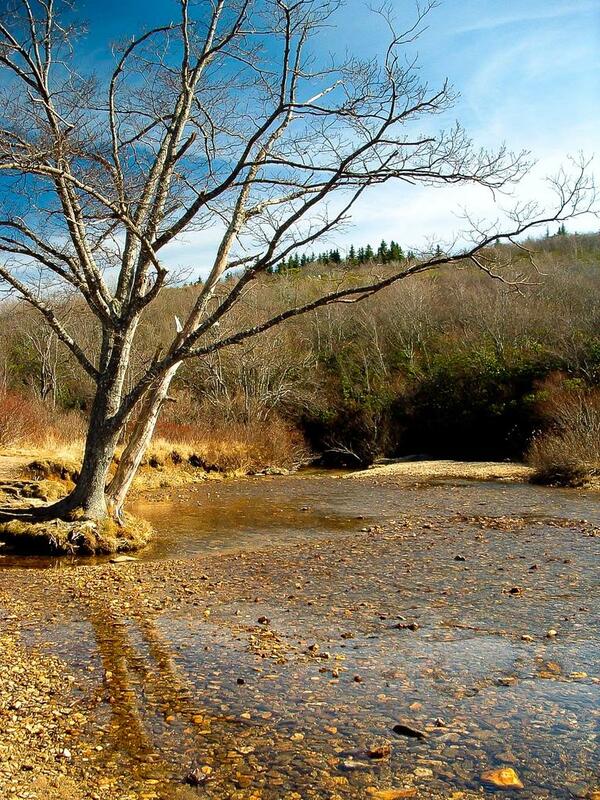 If the Graveyard Fields overlook is full, don't park in the grass, or you will be ticketed. Come back later, or you can still hike into the area via a longer, more difficult hike. 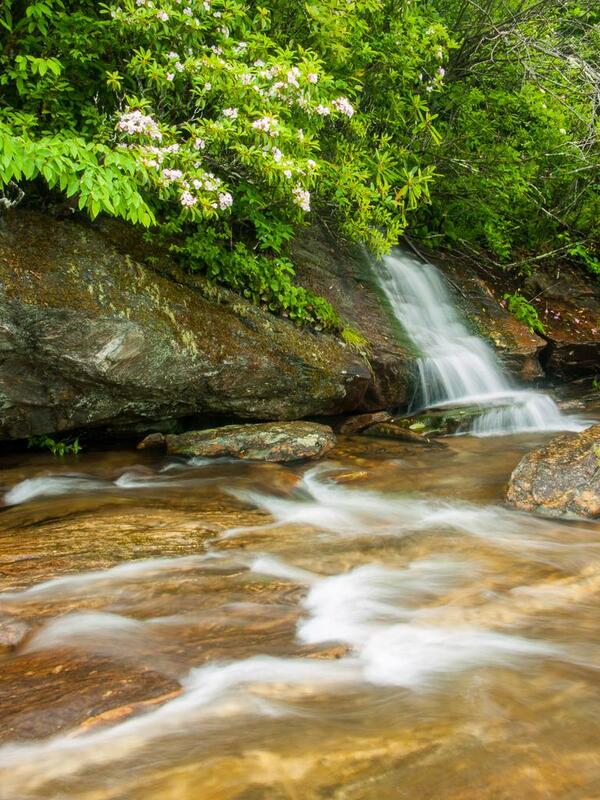 Park at the Looking Glass Rock overlook and take the Mountains to Sea Trail west past Skinny Dip Falls, or parking at the Black Balsam Knob parking area and taking the Mountains to Sea Trail east toward Graveyard Ridge. 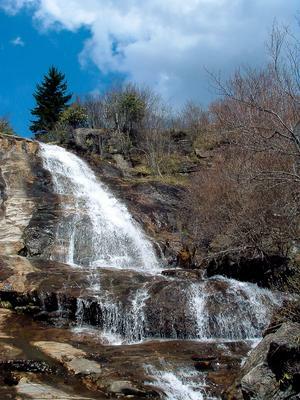 Both of these options offer more difficult excursions into the Graveyard Fields area.